This article contains important fundamentals that every outside player should learn. Coaches, for breakdown drills, see Motion Offense Breakdown Drills and Guard Breakdown Shooting Drills. Know how to jump stop off the speed dribble, and how to receive the pass with a jump stop (see Learning the Jump Stop). Perimeter moves when you have the ball. When you receive the ball, immediately get into "triple threat position". This gives you the three options of being ready to shoot, pass, or drive. Additionally, getting into triple-threat position helps you to see the floor, your teammates, gives you a good look into the post, and helps you to see the defense. Receive the ball within your shooting range. If you are too far out, the defender can back off of you, since you are not a threat to score from that distance. Do not catch the ball and then immediately start dribbling, or even worse, bounce the ball once and lose your dribble. You go from being a "triple threat" to no threat at all! You have lost the dribble option; shooting will be difficult with the defender closing in on you, and the passing lanes will be blocked by defenders playing "deny". 1. Catch the ball and get squared up to the basket so you can see the basket, the defender and any open teammates. 2. Have your hands positioned on the ball in the shooting position, so you are ready to shoot. 3. Keep your weight back on your pivot foot (often the left foot for a right-handed player). Use a short jab step, or drive step, with your non-pivot foot. Jab the foot forward quickly, hold for 1 second and judge the defender's reaction. See if the defender drops back, or stays up. If he/she stays up, see which side is vulnerable to your drive. 1. Read the defender... whichever foot the defender has forward is the vulnerable side and that's the side you attack. Now, we don't really want players looking at their feet... we like them to see the whole floor. So to read the defender, read his/her arm position... the arm that is up high is almost always the same side as the forward foot. So drive at the defender's higher arm... this way you can keep your head up and see the floor. 2. Do not rush the jab step (give it a count of one). 3. The jab step should not be extended too far forward as this results in your weight being forward on the jab foot. 4. To avoid traveling, keep your pivot foot planted until you release the ball from your hand when starting the dribble. Which foot becomes the pivot foot and which is used for the jab step? Some coaches teach that the inside foot (nearest the middle of the court) is the pivot foot, so this would be the left foot if you are on the right side of the court, or the right foot if you are on the left side. We however teach the same pivot foot everytime no matter where you are on the court, believing that this is easier and more natural for the player. So the left foot is the pivot foot for right-handed players, and the right foot is the pivot foot for lefties, no matter where on the court. There are two techniques in receiving the perimeter pass, depending on the amount of space between the receiver and the defender. 1. Situation #1. Plenty of space between receiver and the defender. Catch the ball in a position to shoot, squared up to the hoop. As you meet the pass, you are turning your body to face the hoop. You want to receive this pass with your shooting hand, and as the pass arrives, you "jump behind it", catch it and land with both feet squared up to the hoop. Your left foot now is your pivot foot (for right-handed players), and jab step with the right foot. 2. Situation #2. Tightly guarded with the defender up close on the receiver. The receiver should move toward the ball and catch it with both hands extended, extend the inside foot (closest to the basket and defender) with back to the defender and protect the ball with the body. Now here's where many average players go wrong... many will immediately start to dribble here, instead of making the aggressive pivot and facing the defender. Make a quick, hard pivot into triple threat position (while protecting the ball). (Note this will be a front pivot if the pass is coming from the point and you are on the left wing O3 position, and a reverse pivot if you are coming from the right wing O2 position). You can now make the jab step, and if the defender is up close on you, you can often take it to the hoop. Here is a move you can make when receiving the pass with the defender up close. I call it "catch and go". Once again, move toward the pass, and catch the ball, protecting it with your body. Quickly reverse pivot and this time, swing the ball "over the top", and make the quick step and drive in a straight line to the hoop. 1. Jab step, jump shot. 2. Jab step, straight drive. In triple threat position, make a drive step (jab step) and read the defense. If the defender does not drop back, read his/her arms and feet (see above tips). If the left foot is forward, take a long quick dribble to the right by extending your jab step forward. Go in a quick straight line off the defender's left shoulder to the hoop. The most common mistake players make is going too wide around the defender to avoid contact. This just gives the defender time to react. Go right off the defender's shoulder and don't be afraid to make a little contact. Once you get your foot past the defender's hip, you've got him/her beaten. 3. Jab step, cross-over drive. This is not a cross-over dribble in front of the defender (which is often tipped or stolen). Rather this is a cross-over step. In triple threat position, make a drive step (jab step) and read the defense. If the defender does not drop back, read the arms and feet (see above tips). If his/her right foot is forward, swing the ball low and cross to the left. Quickly cross your right foot over to the left (do not first return your jab step back). Drive in a straight line, hard off the defender's right shoulder. 4. Shot fake and drive. Legendary former coach Bob Knight has said that the shot-fake is one of the best offensive moves you can make, and one that is often under-taught. It's important for both post and perimeter players. Now, after you've hit a couple outside shots, the defender is susceptible to this fake. Also, when the defender is flying out (closing-out) quickly on you, make the shot-fake and dribble around him. Make a shot fake with the ball, your arms and eyes. The ball doesn't need to get any higher than your shoulders or face. When the defender jumps up to contest the shot, drive to the hoop. A good shot fake looks like it's going to be a shot. I often see players make a quick jerky motion which doesn't look anything like their normal shot. 5. Shot fake - one dribble (left or right) - jump shot. This is especially effective if the defender is "flying" at you on a close-out. When you are wide open on the perimeter and receive the pass, the defender will oftentimes "fly" at you with arms up, trying to defend your shot. Usually the defender's momentum will cause him/her to go right past you. This often happens on a skip pass from one wing to the opposite wing when your defender is in helpside and must rotate out quickly, or the zone must shift over quickly. Recognize this situation and when the defender runs at you, make a shot fake. As the defender goes by you, make a one or two dribble adjustment and then shoot the open shot. You may even have an open lane to the hoop. 1. Take it to the hoop for the lay-up. 2. Pull up in the lane (jump-stop) for the short jumper (especially if there are tall inside defenders near the hoop, as in the 2-3 zone defense). 3. Pass off to an open post player, or to a wide open teammate on the three-point arc ("inside-out"). The first option is the best if the lane to the hoop is open. But the interior defense may set up to take the charge. You must recognize this, jump stop and pull-up for the short jumper in the lane. A good, defense's helpside post defenders will pick you up as you drive. As the help defense comes up to defend you, find the open teammate where the help came from, and dish the ball to your teammate for an easy assist. Remember, a penetrating guard who is willing to make the extra pass to an open teammate under the basket is one of the most difficult situations for any defense to stop. 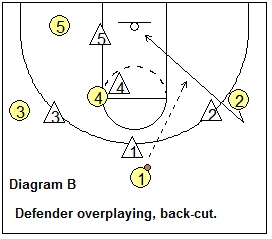 Also read the perimeter player info on the "Basic Concepts of Motion Offense" page. Perimeter moves when a team-mate has the ball... reading the defense... getting open. 1. You are one pass away from your team-mate and the defender is denying the pass to you. Make a fake outside, and then a quick, hard backcut. We use the phrase "over the read line" meaning that if your defender is denying and has one foot beyond the 3-point arc, make a back-cut. The low post on that side should learn to read this situation also and clear out to the opposite side, to make spacing for the backdoor cut. After back-cutting, if you don't receive the ball, you can either screen for a post player, or clear back out to an open spot on the perimeter. Don't get stuck inside or buried along the baseline where (1) you will never be open, and (2) you cause clutter and spacing problems. 2. You are one pass away and the defender is sagging off you. Make a V-cut inside and come back out for the perimeter pass. See Diagram C.
3. You are one pass away, and the defender is playing good defense and you can't get open. Set a screen either for the ball-handler, or screen-away on the perimeter, or down-screen for the low post. This is often a good way to get yourself open. After setting the screen, seal the defender and roll or slip inside, or pop or flare to an open spot on the perimeter. The defense often switches this and you get open for the pass. 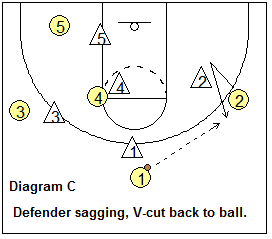 See "Setting Screens". 4. Teammate with the ball is dribbling directly at you. This is called the "dribble-at, back-cut". When the ball is being dribbled directly at you, back-cut to the hoop and then fill out to an open spot on the perimeter. The exception here would be if you are running a weave, hand-off type play. See "Cutting and Faking". Here are additional things to work on, to become the complete outside, perimeter player. Work on your outside shooting, especially "catch and shoot" drills. Work on your dribbling and ball-handling for 15-20 minutes each day. Challenge yourself with even the more difficult drills... don't just do the easy ones. You want to make some mistakes, otherwise the drill is too easy. Twenty minutes every day using both right and left hands, and you will definitely be a better ball-handler and dribbler in just a few months. See the video clips of ball-handling and dribbling drills. Learn how to set screens, pick 'n roll correctly and how to back-cut. Look at this page to learn fundamental cuts and moves for perimeter players as they apply to all motion offenses: "Motion Offense Drills". A good perimeter player must know how to cut and fake and must be a good passer (see Passing). Also, learn the basic principles of good man-to-man defense, on-ball defense, deny and help-side defense. If you learn these concepts, you will have no problem learning to play various zone defenses. See "Basic Defense". This is a lot of stuff but are all "musts" for any complete player. In the video below, Tim Springer shares a great move popularized by Kevin Durant at the Spartan Spring Break Camp in San Antonio.